Sim was born in Edinburgh, the youngest child and second son of Alexander Sim and his wife, Isabella née McIntyre. Sim senior was a Justice of the Peace and a successful tailor with a business on Lothian Road; his wife had moved to Edinburgh as a teenager from Eigg, one of the Small Isles in the Hebrides, and at first spoke only Gaelic. Sim was educated at Bruntsfield Primary, James Gillespie's High School and George Heriot's School. He worked – probably part-time[n 1] – in his father's shop and then for the men's outfitters Gieve's, displaying no talent for the retail trade. In 1918 he was admitted to the University of Edinburgh to study analytical chemistry, but was called up for army training. Sim's performance in Scrooge (1951)[n 2] is considered by many to be the best portrayal of the title character on screen, and is among his best known film roles, particularly in the US. [n 3] In the farcical The Belles of St Trinian's (1954) he played the dual role of Millicent and Clarence Fritton, the headmistress of St Trinian's and her shady brother. Having originally accepted the part of Clarence, Sim agreed to play in drag as Miss Fritton when Margaret Rutherford proved unavailable, and the director and co-producer, Frank Launder could find no suitable actress as an alternative. Sim was among the top British film stars of the early- and mid-1950s,[n 4] but his films of the late 1950s are considered by the critic Michael Brooke to be of lesser quality, because of poor scripts or lack of innovative direction. 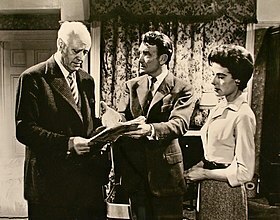 Sim made no films in the decade between 1961 and 1971; it is not clear whether this was, as Brooke suggests, because he found the scripts offered to him unacceptable or, as Simpson proposes, because film makers in the 1960s thought him unsuited to the kitchen sink dramas then fashionable. In 1959, Sim sued the food company H J Heinz over a television advertisement for its baked beans; the advertisement had a voiceover sounding remarkably like his, and he insisted that he would not "prostitute his art" by advertising anything. [n 5] He lost the case and attracted some ridicule for his action, but he was conscious of the importance of his highly recognisable voice to his professional success. Brooke comments on Sim's "crowning glory: that extraordinary voice. Only Gielgud rivalled his tonal control and sensitivity to the musicality of the English language." ^ The American critic Greg Ferrara wrote, "Although there will always be dispute over which is Alastair Sim's finest screen performance, there's little doubt as to which is the best known. 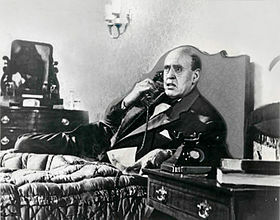 His 1951 characterisation of Charles Dickens' notorious curmudgeon Ebenezer Scrooge is ... generally regarded as definitive", and in 2002 John Corry of The American Spectator called the fiilm "the gold standard by which all the other versions must be judged: the 1951 film in which Alastair Sim, as Scrooge, gives the performance of his career". In Sim's own country he was at least as celebrated for other film roles: in The Oxford Dictionary of National Biography, Michael Gilbert identifies Sim's harassed headmaster in The Happiest Days of Your Life as "the fondest memory for many". 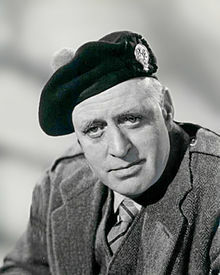 and in 2005, Michael Brooke wrote in the British Film Institute's Sight and Sound, "The St Trinian's films may be the first we think of, but Alastair Sim was a vastly versatile actor without whom the landscape of British cinema's heyday would be a less joyful place." Brooke describes Sim's Scrooge as the "unimpeachably definitive" cinema portrayal. ^ For a number of years in the 1950s, British film exhibitors voted Sim among the top ten local stars at the box office in an annual poll for the Motion Picture Herald: 1950 – equal 8th with Margaret Rutherford; 1951 – 6th; 1952 – 2nd; 1953 – 4th; 1955 – 4th (8th overall). ^ The voice was that of the actor Ron Moody, who regularly imitated Sim, along with many others, as part of Moody's stage act. Sim evidently bore Moody no ill will, and they appeared together in the 1975 revival of The Clandestine Marriage. ^ "Spellbinding times at Heriot's". The Scotsman. 13 August 2009. ^ "George Cole", British Film Institute, retrieved 13 July 2014. Quinlan, David (1992). Quinlan's illustrated directory of film comedy stars. London: Batsford. ISBN 0713461497. Sim, Naomi (1987). Dance and Skylark: Fifty years with Alastair Sim. London: Bloomsbury. ISBN 0747500525.